My twin girls have always loved school, but for the longest time, they dreaded having to read at home. It was battle getting them to read, even for a short amount of time. We checked out tons of different books from the library and nothing piqued their interest until we discovered graphic novels. They have been a total game-changer! 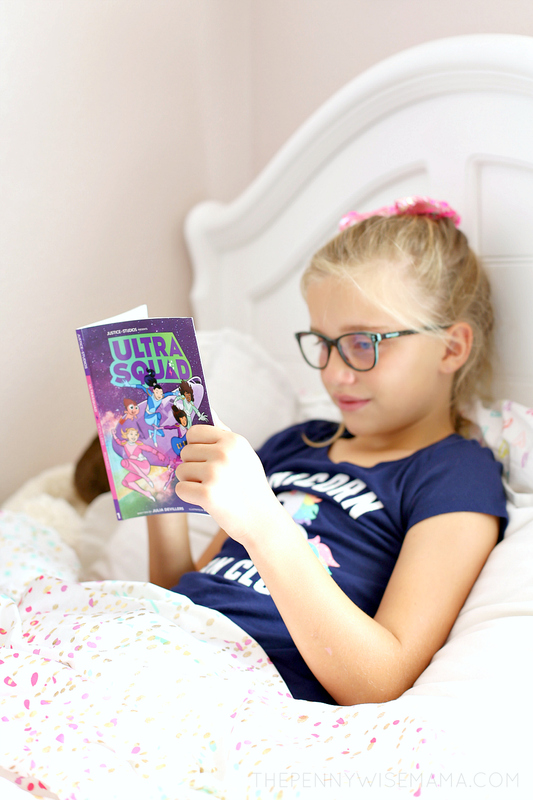 My girls have become obsessed with them, so they couldn’t wait to get their hands on Ultra Squad, a new graphic novel from Justice Studios! I partnered with Justice to bring you this post. All opinions are my own. Justice Studios is the new entertainment division launched by Justice, the #1 destination for all things tween girls. As an extension of the Justice Brand, Justice Studies will focus on creating original content, including graphic novels, video series, music, documentaries and more. 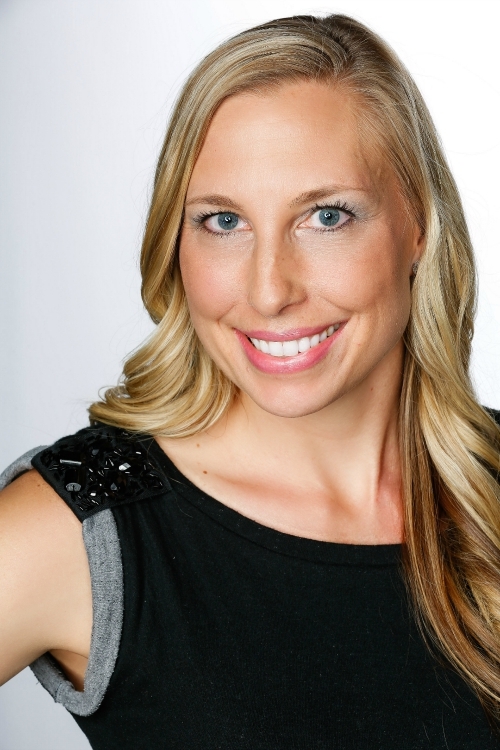 The content will be specifically developed to appeal to today’s sharp and technology-driven tween girl. The first introduction from Justice Studios is a graphic novel series called, Ultra Squad. Written by bestselling young adult author, Julia DeVillers, and illustrated by Rafael Rosado, the series of graphic novels will follow the adventures of four tween girls as they battle an evil force threatening Earth, and use their magical girl powers to save the universe. Four girls are chosen to be a Secret Inter-GIRL-actic Team with new Ultra-Super-GirlPowers and team up with four bizarro-cute extraterrestrial sidekicks to battle an evil force determined to destroy the Galaxy. Posey, Anna, Lyric, and Sky discover that their unique personalities, passions and the power of friendship can make a difference in and out of this world. 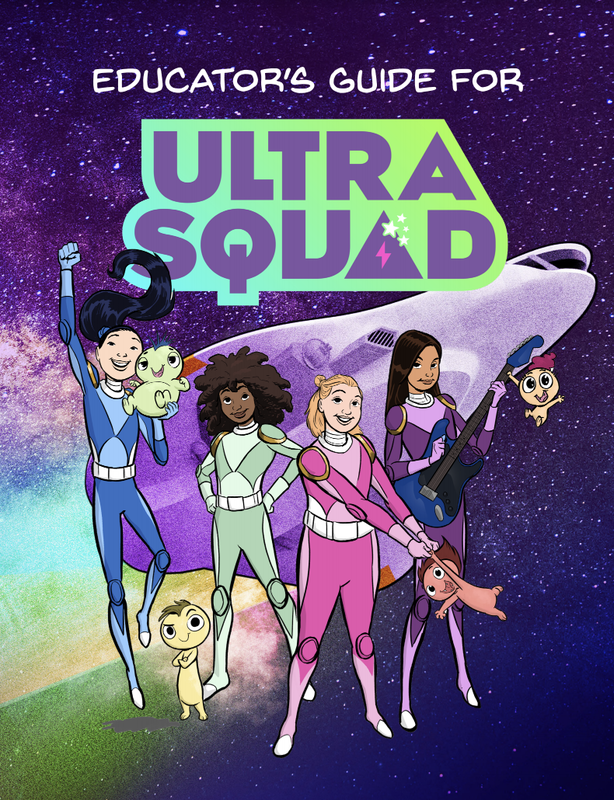 They’re ultra-fierce, they’re ultra-unstoppable, they’re the UltraSquad! 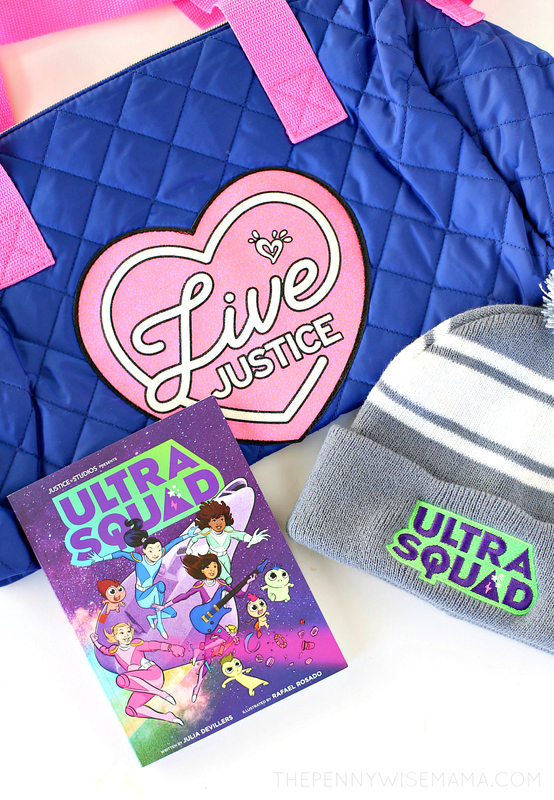 Justice sent us Ultra Squad, as well as some other fun swag, to celebrate the release of the new series. Of course, being twins, my girls fought over who got to read the book first. They both read it in the same sitting — it was so good they couldn’t put it down. I think it’s safe to say that they LOVED it! 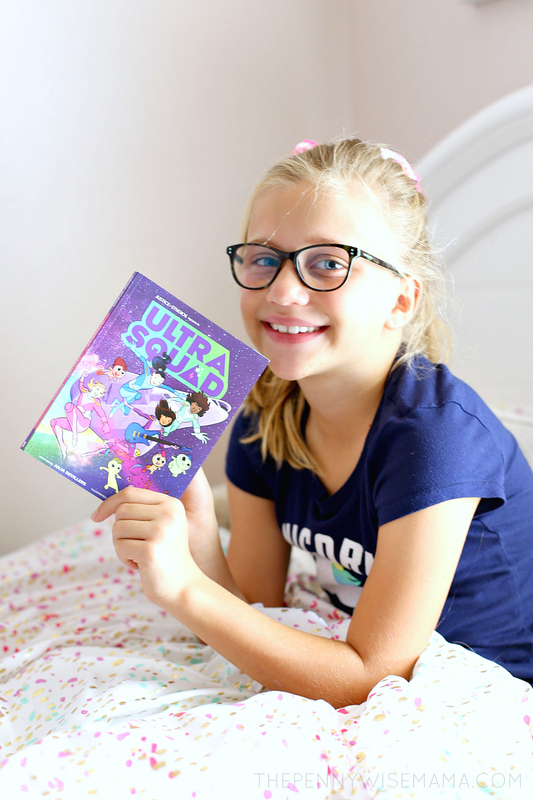 With themes of friendship, teamwork, courage, and perseverance, Ultra Squad is a great book for tween girls. It’s fun, positive, and encouraging, which is just what girls need. We can’t wait to read the rest of the series! If you are a parent or teacher, you’re definitely going to want to check out this handy Ultra Squad Educator’s Guide. It has more info about the book, as well as specific activities that focus on characters, writing, art, and STEAM. It’s a great resource to help your kids extend their reading of the book! Just in time for the holidays, the first book in the series is now available in Justice stores nationwide and online for $8.99. 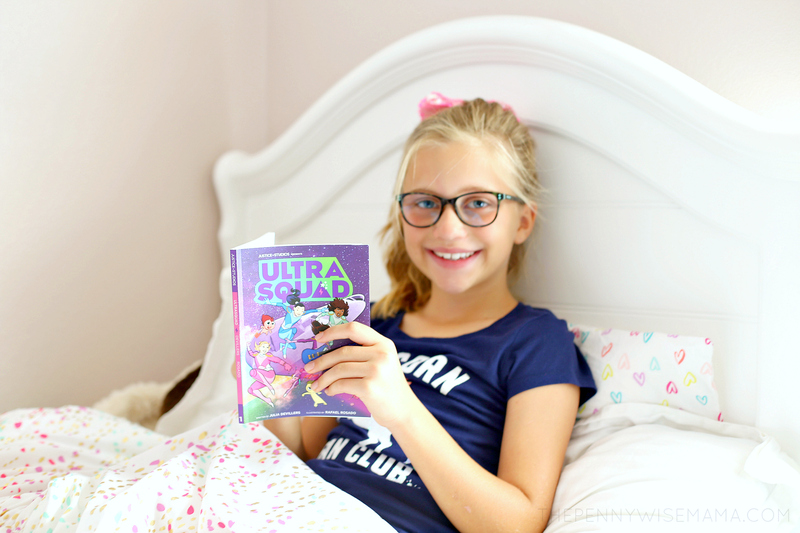 Your tween can even show her Ultra Squad spirit with fun graphic tees available for purchase! For more details and to purchase, visit Justice at shopjustice.com.